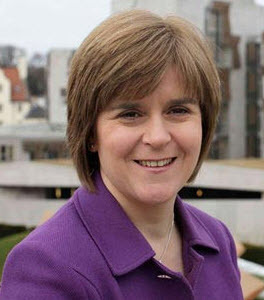 Deputy First Minister Nicola Sturgeon confirmed today that more small businesses than ever before are securing public contracts through Public Contracts Scotland (PCS), the national advertising portal, operated by Millstream, the parent company of Tenders Direct. PCS figures show that 80 per cent of 13,308 suppliers awarded contracts through the online portal in 2012 were based in Scotland. The statistics also demonstrate that 68 per cent of contracts were awarded to Scottish based small or medium sized companies (SMEs), a rise of 12 per cent since 2010. Scotland’s public bodies spend over £9 billion each year on procurement. Construction accounts for more than 25 per cent of the total. The Deputy First Minister unveiled the PCS annual report during a visit to the Scottish Crime Campus at Gartcosh as she highlighted that of the 300 workers onsite, 87 per cent come from within a radius of 25 miles. “As these statistics illustrate, public sector contracts are of great significance to Scottish businesses and play an important role in building a wealthier and more successful nation. “Last year saw substantial changes to Public Contracts Scotland that will further improve and simplify the ways businesses deal with the public sector. “We have had success through PCS with other public sector work. This Balfour Beatty contract is vital at a time when the construction industry is still operating in a challenging economic climate. “The Scottish Crime Campus contract is worth £806,000 to us, which is significant value for a business of our size. We normally take on two apprentices a year. However, thanks to the Balfour Beatty contract, we have employed an additional draughtsperson. “Balfour Beatty was delighted to be awarded the Scottish Crime Campus fit-out contract by tendering through the Public Scotland Contract portal. “We then, for the first time on any Scottish project, used the portal service to successfully procure the work package contractors. The PCS service has benefited all of us. On the project we have appointed local companies employing local labour, which benefits the local community. “We need to ensure that Scottish small businesses know where to look if they’re keen to compete for Scottish public work. The Public Contracts Scotland web-portal is a great interface for both suppliers and public sector bodies. Millstream Associates has managed Public Contracts Scotland, the Scottish procurement portal, since 2006.